Home / Funny Images • Hindi Jokes • Latest Jokes • ModiInAmerica • ModiInUS • Narendra Modi • Politics • Whatsapp jokes / Political crying : Narendra Modi vs Rahul Gandhi !! Narendra Modi: Cries when talking about his mother. 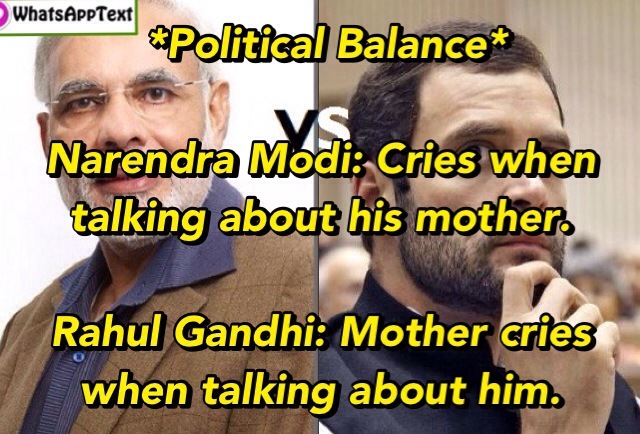 Rahul Gandhi: Mother cries when talking about him. Two Woman friends chatting in office ..
Let us jump while we still have the strength..